Generally, when you bring a dog home, you feed him/her commercial canned food or just raw meat from the butcher shop. If it’s a puppy then plenty of milk. And, this is ok, but just like with us humans, no food is better than homemade. At times, people understand this the hard way, when their dog develops rashes or dry skin. Matter of fact, dog food is made of basically fillers, meat byproducts and useless junk and if your dog is more than a dog, you will want to give better food. 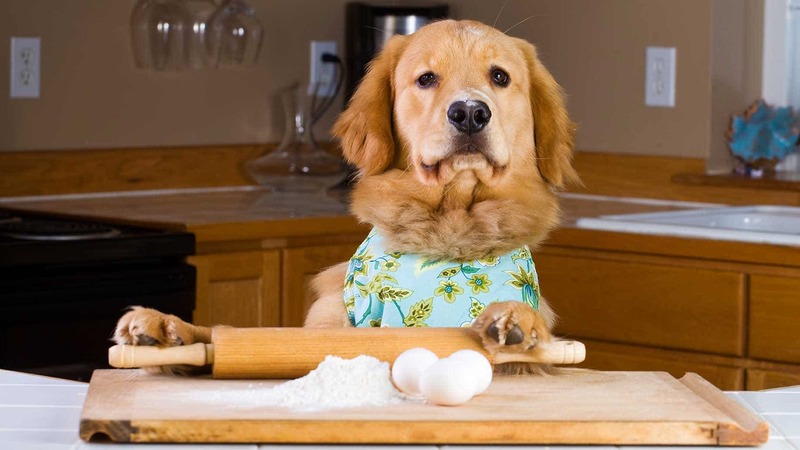 It’s important to know the food you cook is going to give your dog a balanced diet. Also, remember your dog has a very short intestinal tract hence, they can’t chew like us humans. Therefore, it is important for you to ensure your dog gets an adequate amount of nutrients and digests his food properly. To ensure full digestion chop/grind the food properly. Alternatively, you can add flax seeds and fish oil to their food. Though broccoli and cauliflower are healthy, still avoid too much as both have the tendency of giving your dog an upset stomach. Try to use organic vegetables and leaner meats as they are healthier. If you plan on giving rice, opt for brown rice as it contains more nutrients. Use oats to add fiber and bulk to their diet. Use high-quality dry dog food with your homemade food to make sure all vitamins are available in the meal. Here are three homemade recipes that will have your dog eat out of your hand, all the while maintaining their health as well. Dogs love to eat peanut butter. And these cookies are not just a treat, but also a great way to give your dog fish oil that will give him a shinier, softer and healthier coat. If you can get organic peanut butter, would be great as the one available on the counters usually contains unhealthy hydrogenated oils. In case, you can’t find organic peanut butter, you can make it at home. Just blend together raw peanuts and peanut oil in your processor. Voila! Your peanut butter is ready. With help of a cookie cutter, cut desired shapes and set on to a baking sheet and bake for 40 minutes. Chop all the veggies into small cubes. Add all the other ingredients in a large pot and cook for at least 30-45 minutes and serve. This is ideal for puppies or old age dogs. Add all the ingredients in a bowl and cook at a low temperature for approximately 5-6 hours. This is perhaps the simplest and healthiest homemade recipe for your dog. Your dog is more than a dog. It is part of your family. Just like the health of your family matters to you. Likewise, the health of your dog is also going to be your concern. Here we have given you just three recipes, but you can find more and give your dog a different meal that is not just homemade, yet healthy as well.